“There’s no reason to be the richest man in the cemetery. You can’t do any business from there. 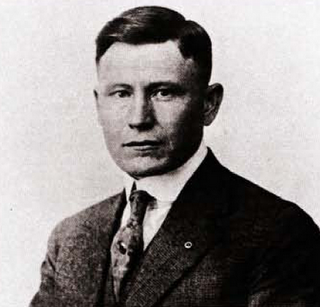 Harland David Sanders was born on this day near Henryville, Indiana in 1890. Today is the 122nd anniversary of his birth. He lived in poverty in rural Indiana sharing a four room shack with his father, mother, brother and sister. His father, a farmer and a butcher, died when Harland was 6 and his mother went to work in a tomato-canning factory to help support the family. Harland took on many of the household chores including taking care of his younger siblings and doing the cooking. During the Depression Sanders opened a service station in Corbin, Kentucky and began to sell chicken, ham and steak dinners on the side. Eventually the meals, which he actually sold out of his living quarters next door to the service station, became so popular that he moved to Sanders Cafe a 142 seat restaurant at a nearby motel. He slowly perfected his recipe for fried chicken. Some estimates say it took over 1,000 tries to get the proper mix of herbs and spices for his “special recipe.” Sanders used a pressure fryer instead of frying pan to speed up the cooking process and seal in the meat’s juices. In 1935 Kentucky governor Ruby Laffoon gave him the honorary title of “Kentucky Colonel”. By 1950 he had grown his trademark mustache and goatee — which he bleached white to match his hair — and took to wearing a white suit and black string tie at all public appearances. When an interstate reduced the traffic to his restaurant he started to look at the franchising model as a way to grow his business. He moved to Mississauga, Ontario and concentrated on building his Canadian chain while continuing to make appearances on both sides of the 49th parallel. 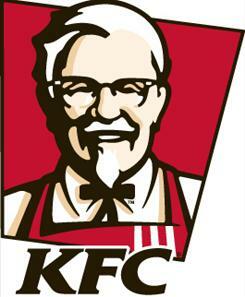 The Colonel had a philanthropic side as well and he funded many charities and scholarships. 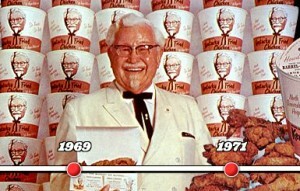 He diagnosed with leukemia in June of 1980, Colonel Sanders died of pneumonia the following december. There is now a museum honoring the Colonel and all things KFC in Corbin Kentucky at the site of the original restaurant. To learn more about the museum go here (for a link to the Corbin County tourism link) or here (for a personal take on the museum by Brent Moore). 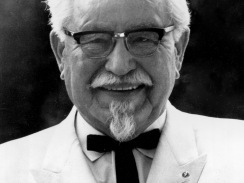 This entry was posted on Sunday, September 9th, 2012 at 12:34 pm	and tagged with Colonel Sanders, food, restaurants and posted in Colonel Sanders, Food, postaday, Thought of the Day, Today's Birthday, United States. You can follow any responses to this entry through the RSS 2.0 feed. Our aim is to spread the love of Blogging and encourage achieving Bloggers to do their best, so keep up the brill work!